Edward Norton (Eisenheim), Paul Giamatti (Inspector Uhl), Jessica Biel (Sophie), Rufus Sewell (Crown Prince Leopold), Edward Marsan (Josef Fischer), Jake Wood (Jurka), Tom Fisher (Willigut), Karl Johnson (Doctor/Old Man), Aaron Johnson (Young Eisenheim), Eleanor Tomlinson (Young Sophie). The Illusionist is a romantic thriller set in 1900 Vienna during a period of political unrest. Eisenheim is a brilliant stage magician pitted against the power-hungry Crown Prince Leopold and the shrewd Chief Inspector Uhl. Between Eisenheim and the Prince is the woman they both desire, Duchess Sophie von Teschen. As children, Eisenheim and Sophie begin an intense romance. But when they are forbidden to see each other, the young magician is driven from the town. He disappears after that, embarking on a journey in pursuit of secret powers. Years later he appears in Vienna, now a successful stage magician, and there he meets Sophie again. After so many years, she had given up hope of ever seeing him and is now engaged to marry the Crown Prince. But Eisenheim and Sophie soon rekindle their affair and decide to escape together. Inspector Uhl, who acts as a spy for the Crown Prince, exposes the lovers and later Sophie is discovered murdered. Eisenheim now must summon his extraordinary powers in a desperate attempt to prove the Prince guilty. While Uhl tries to stop him, Eisenheim foments a political uprising to bring down the monarchy before it completely destroys him. 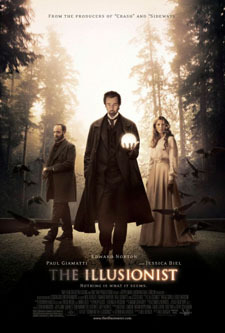 A supernatural mystery that combines romance, politics and magic, The Illusionist, written by Neil Burger, is the latest film from the producers of the Oscar winners Crash and Sideways. The film stars Academy Award nominees Edward Norton and Paul Giamatti as two men pitted against each other in a battle of wits: Norton as mysterious stage magician Eisenheim, and Giamatti as Vienna’s shrewd Chief Inspector Uhl, with Jessica Biel sharing the screen as the beautiful Sophie von Teschen. In a world where nothing is as it appears, an illusionist and a police inspector face off in a challenge of wills that attempts to determine where reality ends and magic begins…all the while blurring the line between power and corruption, love and devotion, vigilance and mania and ultimately, life and death. This film, enhanced by a magnificent score by composer Phillip Glass, is sure to keep you on the edge of your seat and transport you to a time that embraced the supernatural. Written by Neil Burger, based on the short story Eisenheim the Illusionist by Steven Millhauser. Produced by Michael London, Brian Koppelman, David Levien, Bob Yari, Cathy Schulman. Executive producers: Jane Garnett, Tom Nunan. Co-producers: Tom Karnowski, Matthew Stillman, David Minkowski. Production design by Ondrej Nekvasil. Art direction by Vlasta Svobodova, Stefan Kovacik. Set decoration by Petra Habova. Costume design by Ngila Dickson. Supervising sound edition by J. Paul Huntsman. Sound design by Michael Babcock. Special effects by Vulcan Effects. Special effects supervision by Roman Tudzaroff. Visual effects by Universal Production Partners. Visual effects supervision by Viktor Muller. Technical advisers for magic: Ricky Jay, Michael Weber. Assistant directors: Kieron Phipps, Jan Mensik. Casting by Deborah Aquila, Tricia Wood, Nina Gold.